After you have installed PocketTV, you can try it by downloading and playing those small MPEG bitstreams. 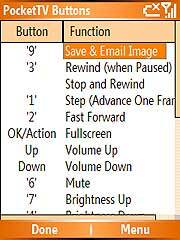 To download those MPEG files on your PC, right-click on the link and select "Save Target As..." in the pop-up menu. We have a FAQ article that explains How to copy MPEG files into your device or Storage Card. If you are not familiar with the process you should read it. 600 Kbps, SIF size (need fast processor, e.g. iPaq). Those clips are for demonstration only. They are optimized for Windows Mobile devices. If you have a Smartphone with lower resolution display, you can download some test MPEG files from pockettv.com/mpg/sp. 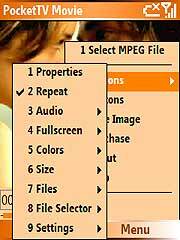 If you have a Pocket PC with VGA-resolution display, you can download some test MPEG files from pockettv.com/mpg/vga. PocketMovies.net has hundreds of downloadable FREE videos and cartoons in MPEG format already optimized for PocketTV. The PocketTV Encoding Page has a Simple Guide that explains how to convert your VCD's, DVD's and any other video files into a format optimized for PocketTV. LikeTelevision.com has lots of downloadable MPEG's (it's a subscription service). Replay Video Capture (previously WM Recorder) is a cool new tool that records Windows Media video and audio streams on your desktop for playback on your Pocket PC Phone or Smartphone. You can record and watch music videos, news clips, corporate webcasts and any other streaming video or audio. You can then convert those recorder video files into a format optimized for PocketTV (using our Simple Guide) and watch them with PocketTV on your device. PocketRocketFX.com has lots of downloadable free videos already optimized for PocketTV. Many other sites have free downloadable video content. You may need to use WM Recorder to capture streaming video. 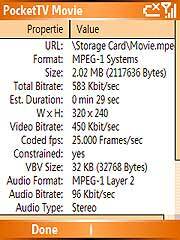 Then use our Simple Guide to convert those video files in MPEG format suitable for PocketTV.